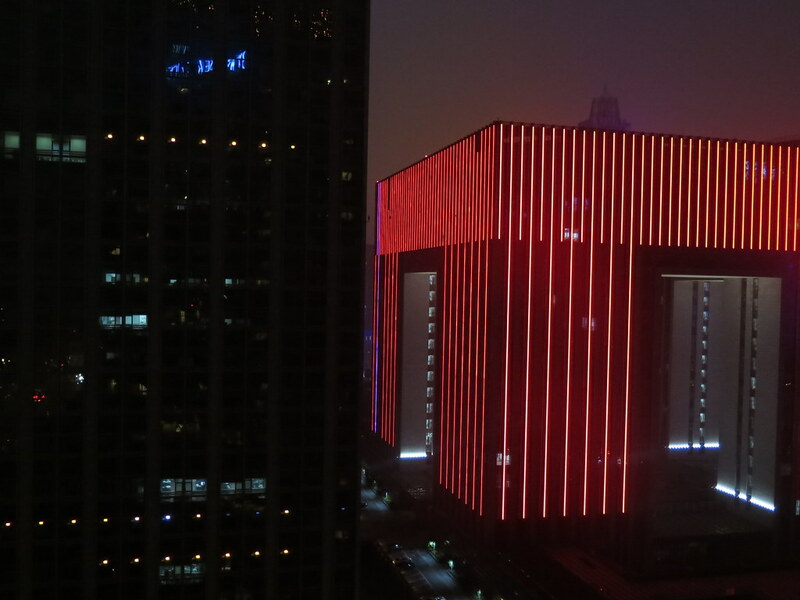 We spent a couple of days relaxing in Nanjing, which luckily coincided with some terrible weather. It had been really warm and muggy when we arrived, and within a couple of hours of getting into our apartment, the heavens opened and it poured with rain. It made having a great place to stay feel all the sweeter. Again, big thanks to Chen for helping us so much. He took us out for a couple of beers one evening with his colleague Ken and we had a great time chatting and hearing about the expat life in China. 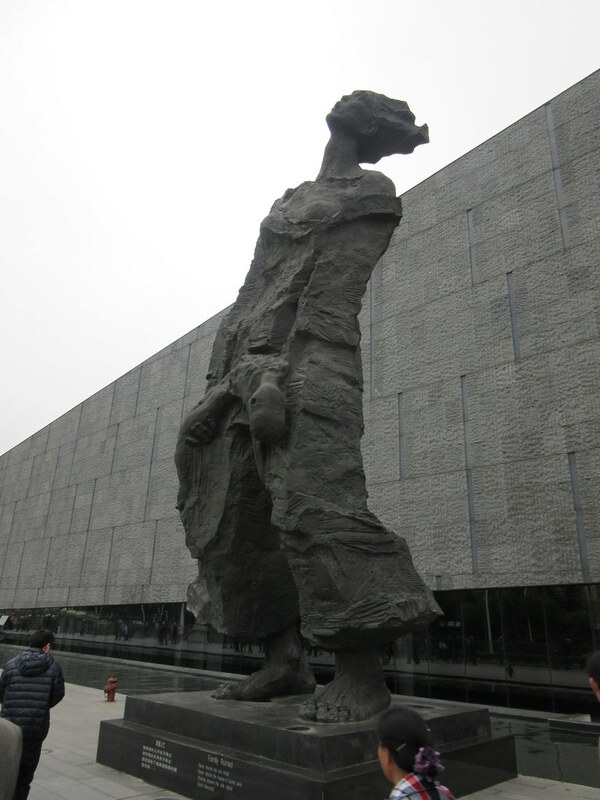 On our free day, we went to visit the Nanjing memorial and museum. Not the most uplifting couple of hours, but interesting, and something that isn’t really talked about much in Japan. We had a bit of a walk around the city, but the weather was still quite gloomy so we soon gravitated back to the apartment. Around the building were various shopping malls and western supermarkets and restaurants which we made the most of. 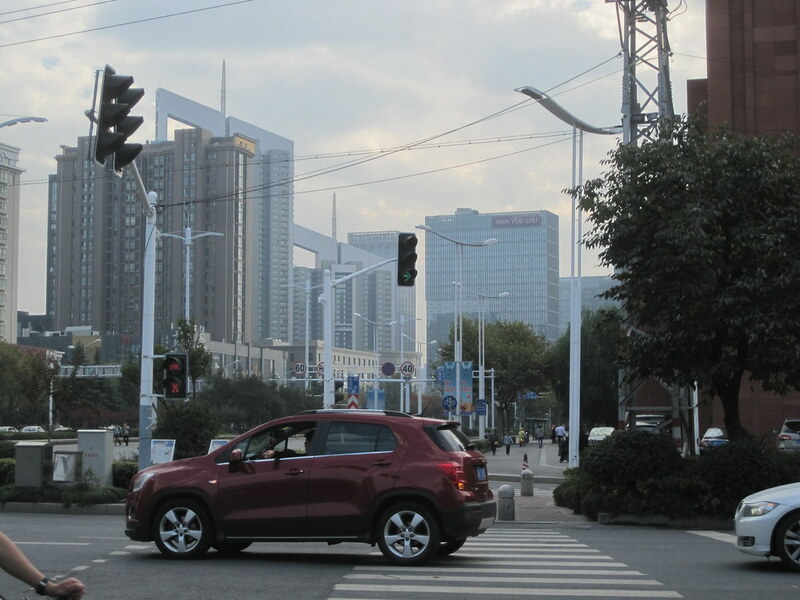 It was a taste of modern, internationalising China that we hadn’t really seen yet. 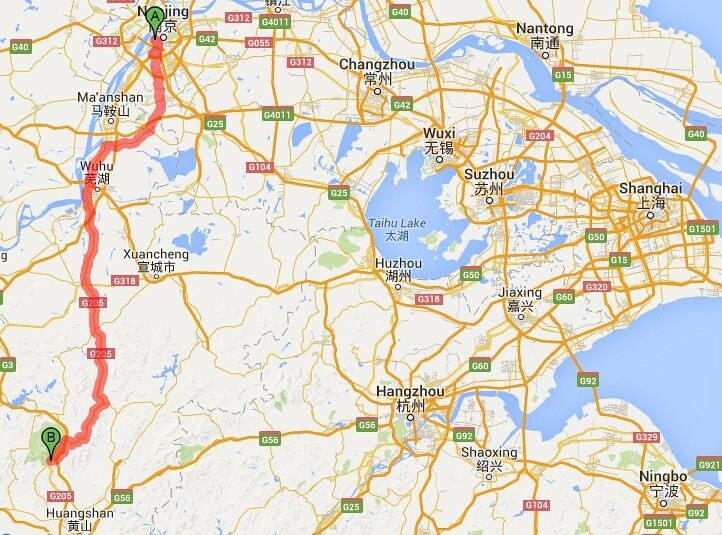 We headed out of Nanjing on the 8th. 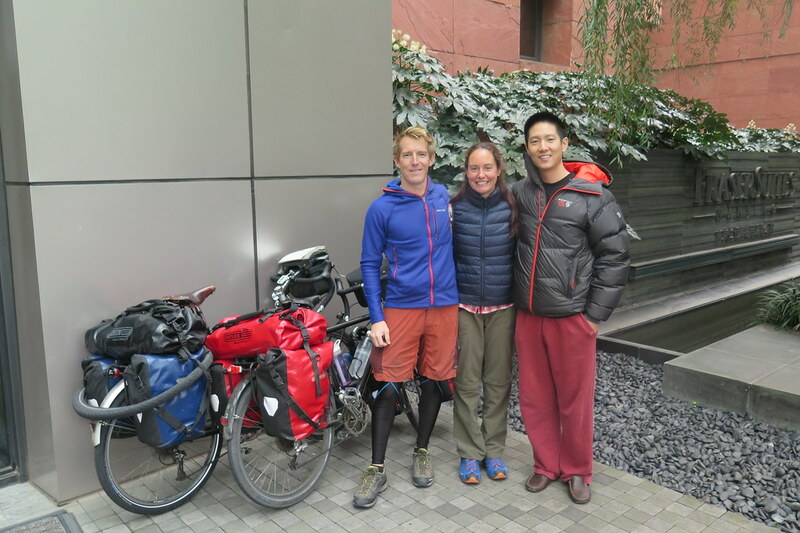 We loaded up on the amazing buffet breakfast, said goodbye to Chen and his family and then started rolling south. Via a Carrefour supermarket to grab a couple of last minute luxuries for further down the road. Warmshowers Jim had given us a recommended route out of the city that he sometimes rides. 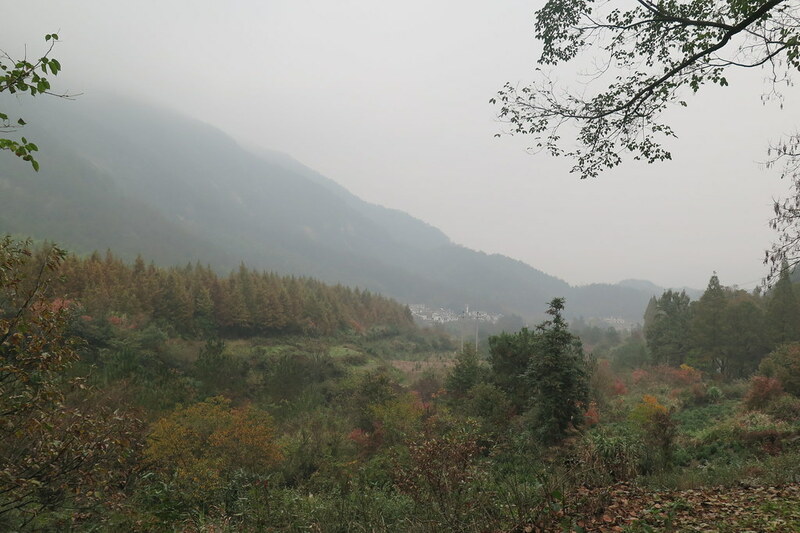 It took us quickly onto quieter (for China) roads and through a nice green and hilly area, past parks and villages. We didn’t really know how far we’d cover as we only left at around midday. 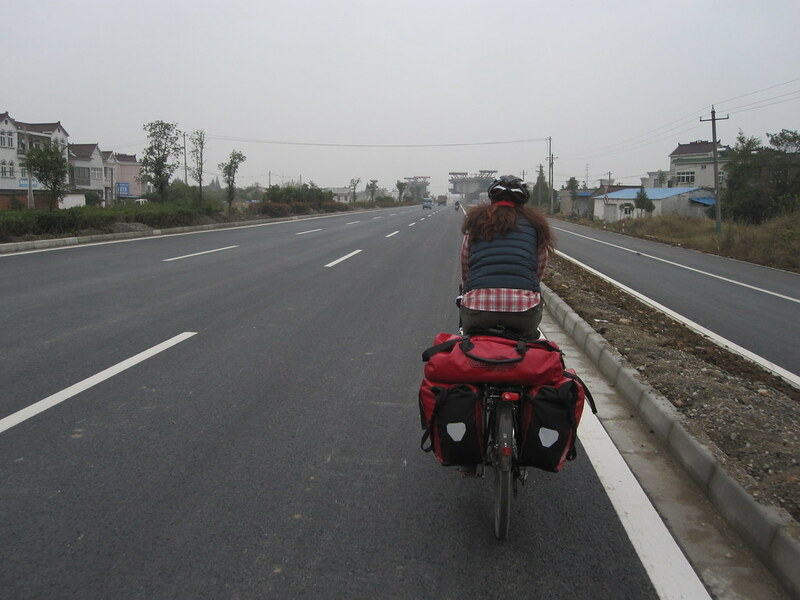 Thanks to the good roads, we made decent progress up to about 50km but then we reached roadworks. The surface deteriorated and with the rain over the previous days, we were riding through mud which did a good job of covering our bikes and panniers. By 60km even though it wasn’t yet 4 o’clock, the sky was getting very gloomy and dark so we pulled into the next hotel we saw. A friendly little guesthouse which was super cheap, and the owner’s young son was keen to practice his English with us. The following day, things started looking up. 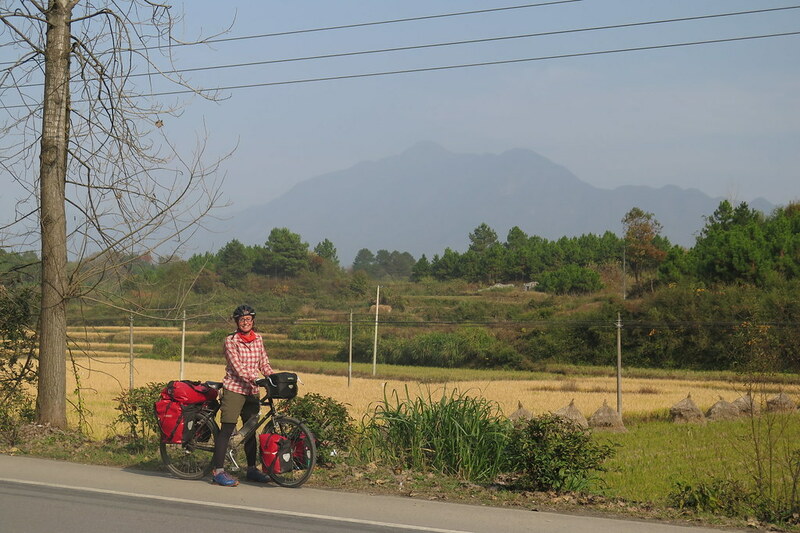 The weather was clearing in the morning and by our morning coffee break we’d reached Jingxian and could see the mountains ahead. 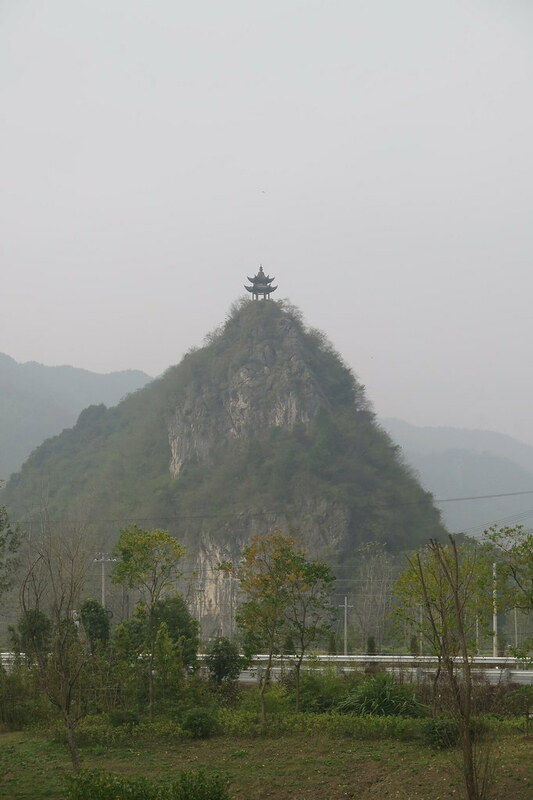 We stopped next to a rocky outcrop with a pagoda perched high above. The view was great encouragement and we were looking forward to the rest of the day. Which got better and better. 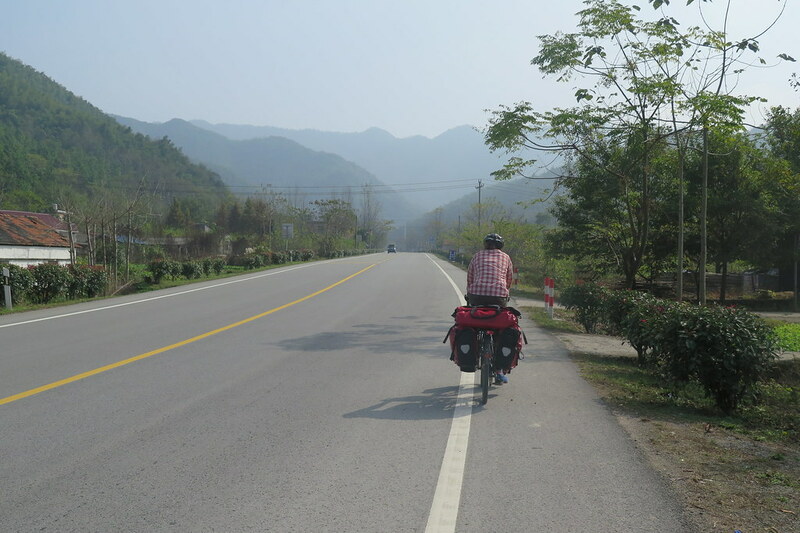 We were still on the G205, a major national route, but as it got into the mountains, it narrowed to two lanes with a wide shoulder and perfectly smooth tarmac. We passed farms and forests as the sky got bluer and the sun rose higher. The road climbed, but it was a pleasure to be riding uphill as we finally were enjoying the amazing scenery we’d been looking forward to. With the smooth roads the downhills were fast and exhilarating, but as ever, over too quickly! Just before lunch at about 55km for the day, we ticked over 4,000km total for the trip. A high five and a photo then a big plate of dumplings for lunch to celebrate. 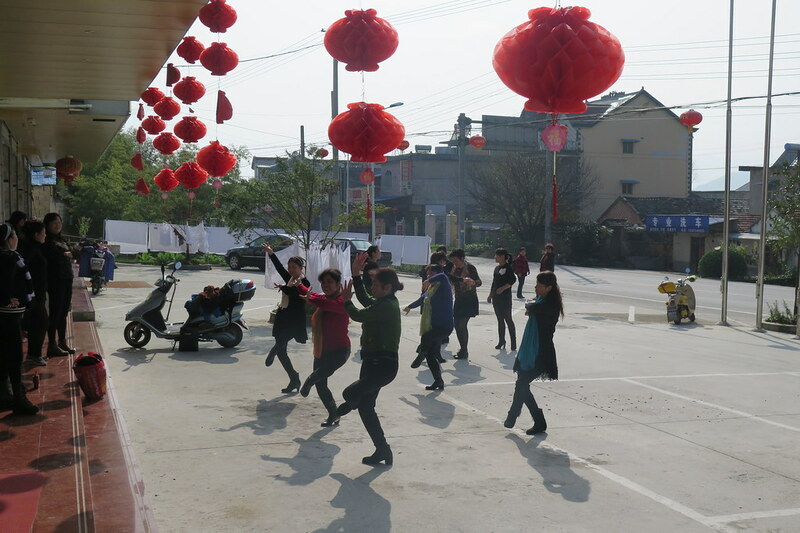 I think the group of ladies dancing outside the restaurant were celebrating with us too. The rest of the day continued in the same way, a quiet road and good views. 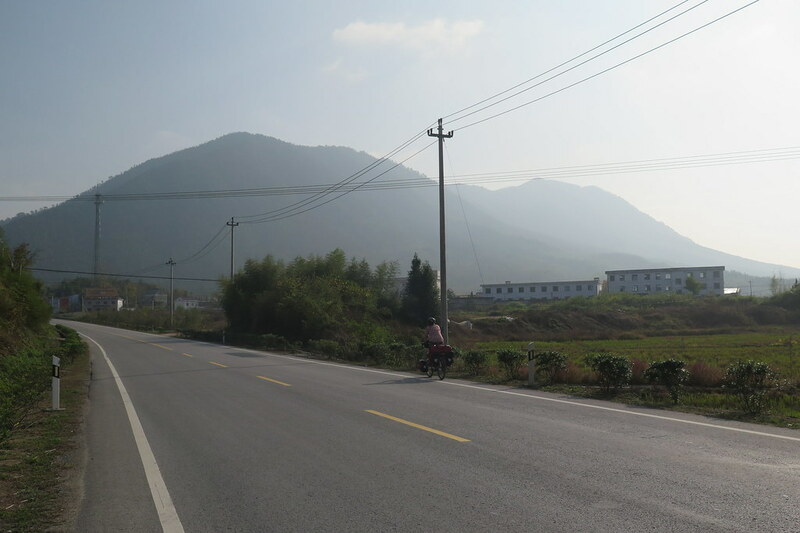 We had to reach about 100km to get us to Baidi, which would give us a short ride the following day to get to the entrance to Huangshan scenic area. With all the pulling over and getting the camera out, we thought it might be a bit of a push before the light started to fade. But we were feeling good and rode quickly in between photo stops. 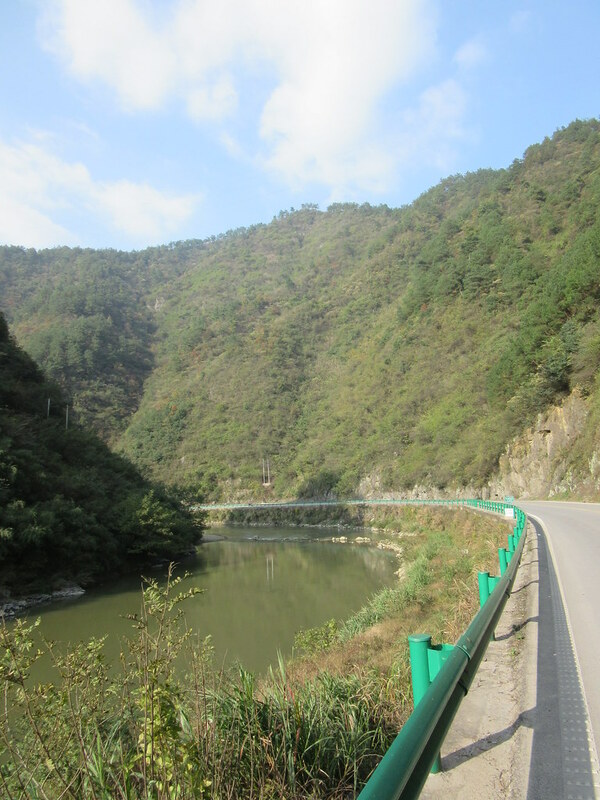 We came through a steep sided river gorge and out into a wider valley. 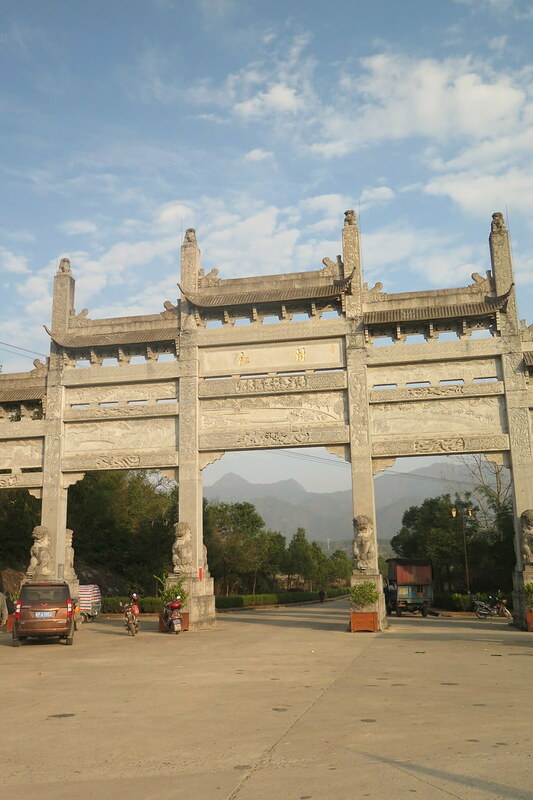 A big stone gate was the entrance to Baidi where we found a cheap guesthouse for the night. 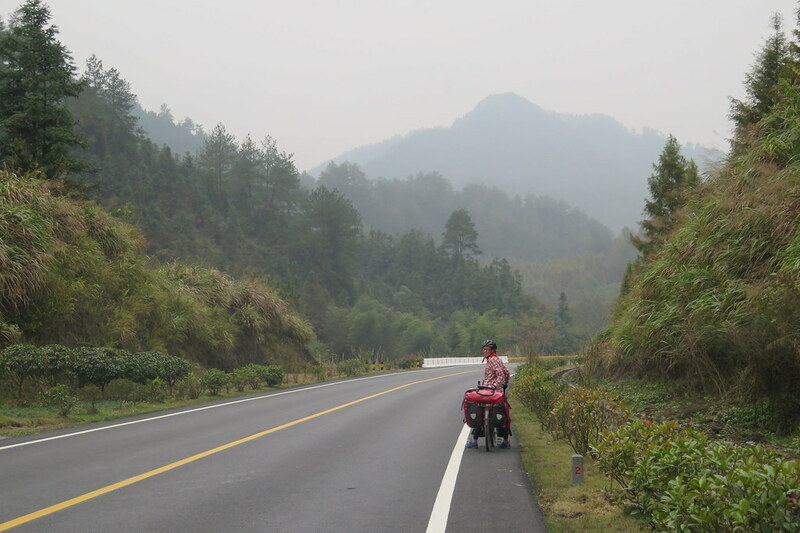 The map showed some more wiggles to get us over a couple of low passes and into Tangkou, the entrance to Huangshan, the next day. 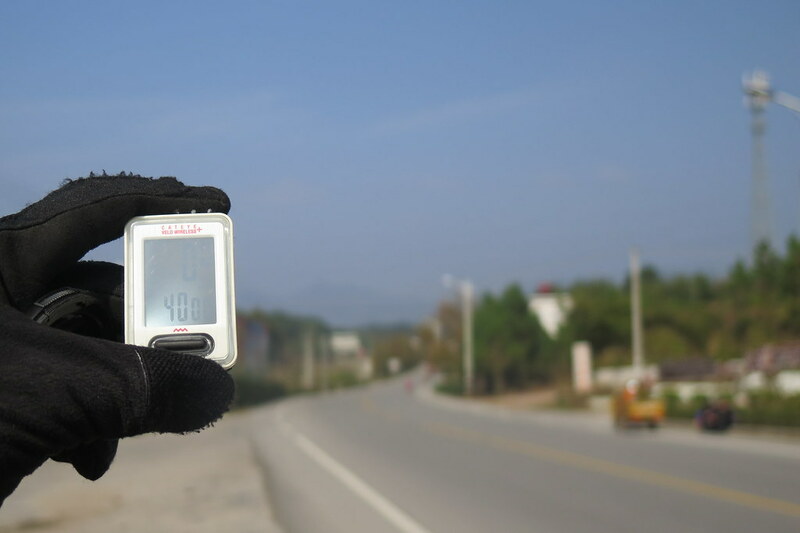 It was only going to be a short day, so we set off riding quite quickly and had soon reached the top of the first pass. We came down into another valley with tea plantations all around. 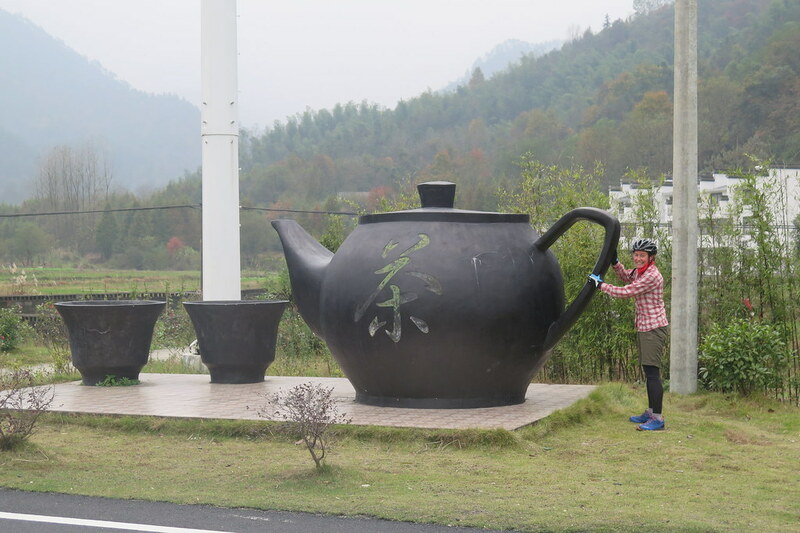 We were coming into tea country! 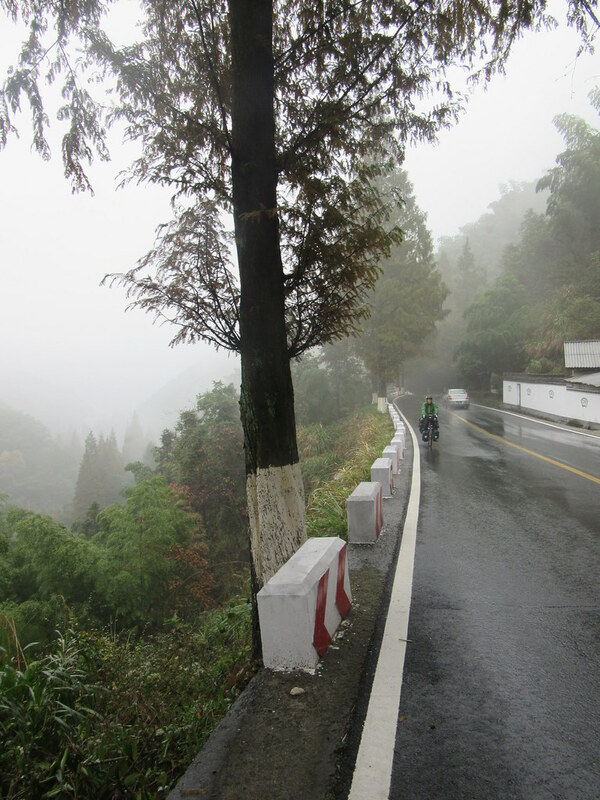 At the bottom of the second climb, the rain started. We dug the waterproofs out and pushed on up the zig zags. The mountains above us looked rocky and wild from what we could see, but the cloud level was quickly dropping and we were soon surrounded by mist. 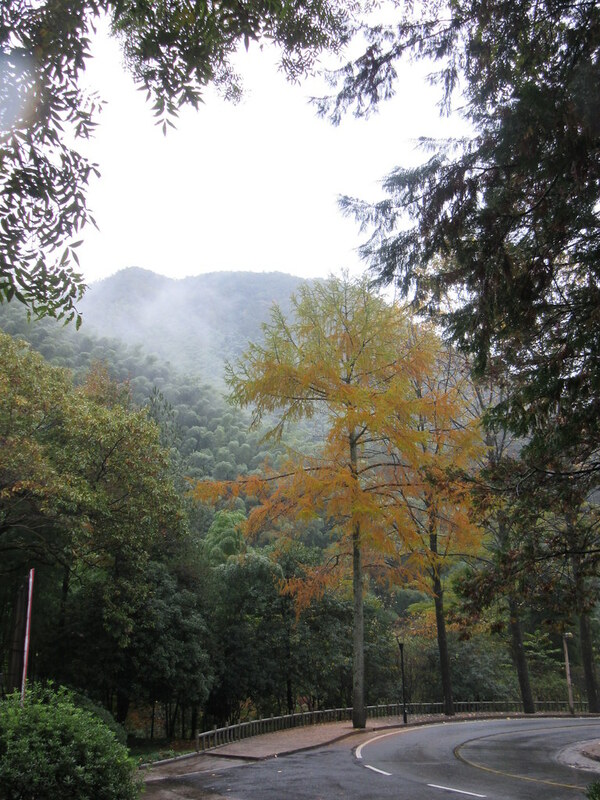 Huangshan or Yellow Mountain is one of the most famous mountains in China. 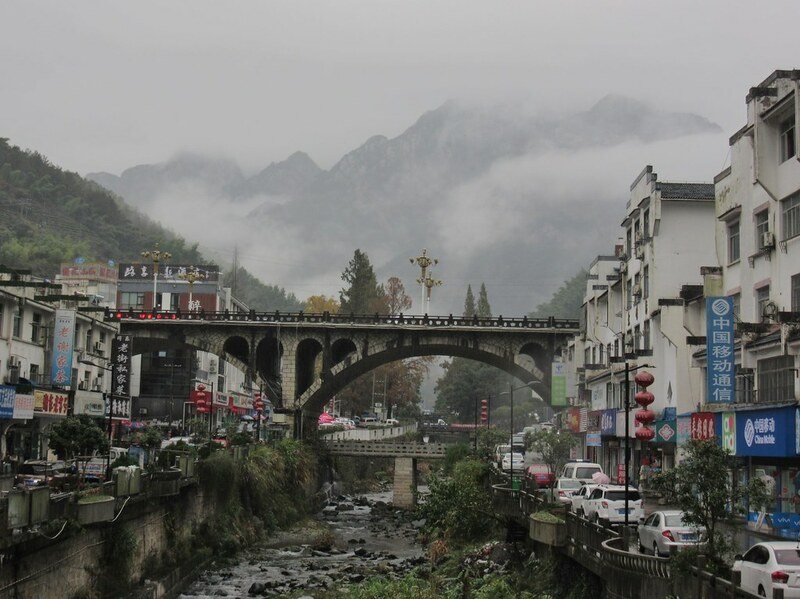 Its rocky and jagged peaks make this area a major tourist draw and the backdrop to a number of movies and countless works of art. We’d been looking forward to having a ‘rest’ day here and doing some hiking up in the hills. 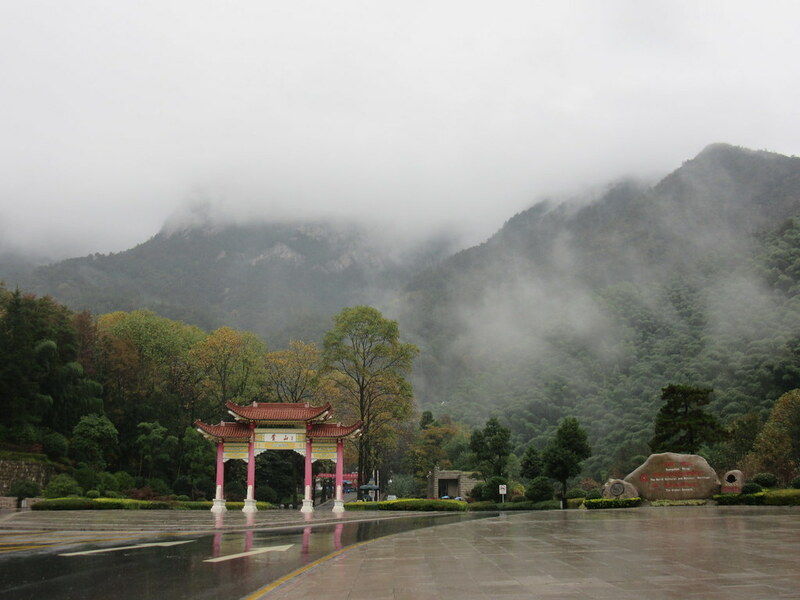 However, the weather didn’t cooperate and we had more rain and low cloud the next day too. 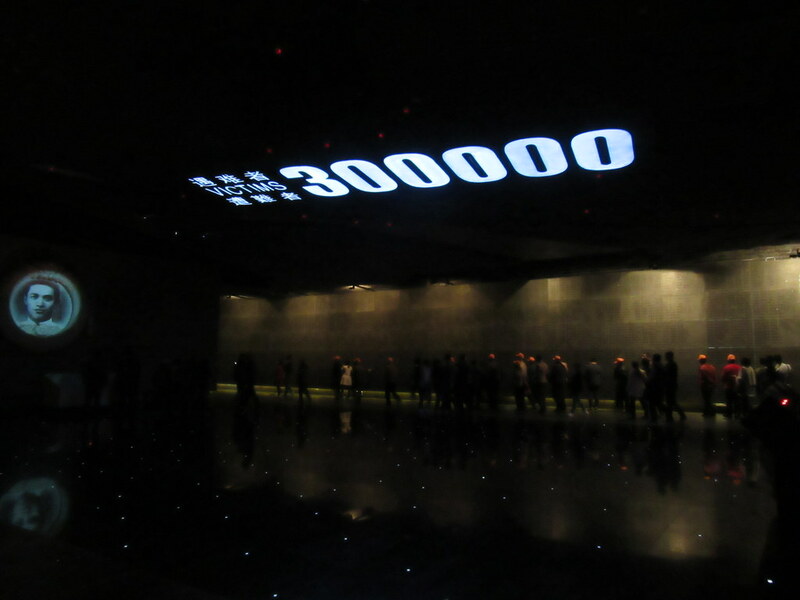 The entrance fee for the park is a ridiculous 230 yuan per person, plus minibus fares to get in to the park entrance. We couldn’t really justify smashing several days’ budget to wander around in the clouds getting soaked, so we had a real rest day, spent chilling in a guesthouse, watching tv and planning the route ahead. Chapeau guys. Although rather worryingly, the advert at the bottom of this blog is from Durex. Does that reflect badly on me or you LOL ?